How Do Schools Benefit From Solar Panels? 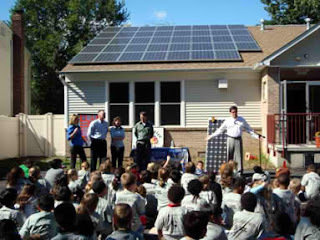 Schools benefit in many ways from having solar panels. They are a visual teaching aid for the students in several subjects. A photovoltaic system can be used to produce power, heat, and hot water for the school to use. By producing its own energy to cover school needs, monies usually spent on electricity are freed for other uses. Solar panels, mounted on their own poles, are a wonderful teaching aid. They allow the students to see what they look like and how they are installed. They can observe how the panels follow the path of the sun. Closer examination reveals how solar panels work. Monitoring electricity output levels, comparing sunny days to overcast ones, determining equal fossil fuel consumption are all possible classroom activities. This can be accomplished by making use of an online monitoring system that displays relevant data. Studying solar power first hand provides a unique entry into the fields of mathematics, ecology, economics, and several branches of the sciences. The curriculum can be easily tailored to the age group of the students. For older students, career options in renewable energy can be explored. By working directly with the photovoltaic system, valuable work experience is attainable. Using solar panels to produce enough power to meet the electrical needs of the school is another benefit. Monies previously budgeted towards payment of monthly electric bills can be diverted to other expenditures, or lower the annual school budget. One middle school in Vermont anticipates saving $25,000 per year with their newly installed photovoltaic system.1 The state of California anticipates saving $1.5 billion with their Solar Schools Initiative program.2 As the benefits of having a solar panel system on schools are publicized, more communities are finding ways to make it happen. By having solar panels on site, the school has a more stable source of electricity. Grid based power outages will not affect the school in any major way. Backup batteries ensure business as usual. Diesel generators can be decommissioned, freeing utility space. Technology has grown sufficiently to include solar heat and hot water systems. If the school’s solar panel system has been designed to include them, there is no need to burn fossil fuels. This saves even more money, as well as provides cleaner air to breathe. From local elementary schools to large universities, solar panels are becoming more popular. They save the school and the community money, and provide a plethora of educational opportunities.